Back in 2013 I was interviewed by Print Club London for a little film they were doing about their Film 4 Summer Screen exhibition at Somerset House. I answered questions about my artwork, my process and opinions on the modern creative landscape. When I left their Dalston studios it dawned on me that there was very little representation of the UK graphic arts scene committed to film, especially in long form documentary format. There was a definite story to be told, and one that would allow for pure visual indulgence in recording the processes of artists from many disciplines. But this film isn’t just about the creative brilliance of people who have informed the way our world looks. It's also a story that sympathises with the way many people feel in the modern age: overwhelmed and bombarded with information twenty four hours a day, longing for some time away from the multitude of screens through which we work, consume, create and record the world around us. So many creative people are turning to mediums that take them away from their computers. Methods of making work that involve making real, tactile items to be cherished and kept, instead of being consumed and forgotten. However, very few creatives could have an audience or career without the trappings of the internet and social media, and this tension between the analogue and digital world is the story we are pursuing in Made You Look. Artist, illustrator, creator of monsters and record sleeves. 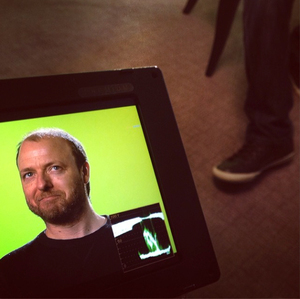 Paul O’Connor is the owner of successful video production company Mechanical Mouse and an award winning multi-disciplined director and producer. With over ten years experience in the industry, Paul is a talented DOP and Editor who has managed and directed projects for clients such as Blackberry, HP, VW, Nokia and the Bill & Melinda Gates Foundation. Anthony is a muti-disciplined creative who has over ten years experience in the graphic arts and has worked with clients such as Shortlist, New Scientist, Nobrow, HSBC, Macmillan Cancer Charity & John Lewis amongst others. His work has been exhibited in London, Los Angeles, New York, Milan and Paris. David has over 10 years experience working in film production, exhibition and strategic industry development. He was the creative director of the Wood Green International Short Film Festival for two years, and has managed short film production funds in partnership with the BFI, Film London, Creative Skillset and the Mayor of London, commissioning over 20 short films from emergent directors, which have gone on to be programmed at London Film Festival and Venice Film Festival. Stuart has worked all over the world as a lighting cameraman and DOP for a diverse range of clients such as Microsoft, Shell, Blackberry, Forever and TED. He has also worked on a variety of projects such as award winning mini-docs for Atkins, commercials for B&Q, documentaries about Romanian orphans and Welsh literacy and live camera work for TV news specials and high profile charity fund raisers.